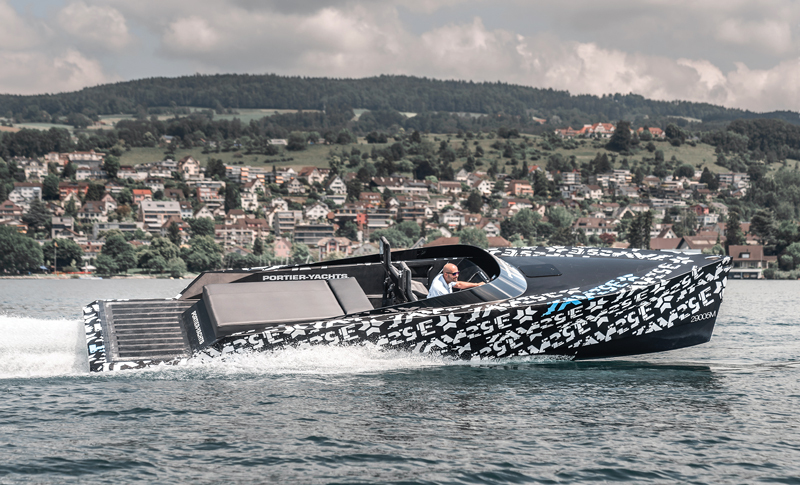 The all-carbon SAY29E (8.8m) was officially clocked at 95 kmh (51.3 kt) during runs sanctioned by UIM on Lake Constance, Germany. Johan Ullman, an occasional PBB contributor and maker of shock-mitigating seats for high-performance recreational and military boats, recently brought to our attention the achievements of German boatbuilder SAY GmbH, which boasts a world speed record for electric boats between 8m and 10m (26.2‘ and 32.8‘). SAY was founded in 2006 by Sven Ackermann, a German naval architect; the yard is located near Lake Constance, which borders Germany, Austria, and Switzerland. Early work focused on high-performance monohulls and multihull sailboats, but that changed in 2012 when customer demand diverted their interests to power. Karl Wagner, who founded Carbo Tech Composites in 1993 in Salzburg, joined SAY as an investor in 2015, enlarging operations in a modern purpose-built facility in Wangen. This world speed record for electric boats was sanctioned by the UIM (Union International de Motornautic in Monaco), which required several straight-line runs between buoys. Top speed recorded was 95.0 kmh (51.3 knots), and an average documented at 89 kmh (48.1 knots). A total of six runs were made, each measured by high-speed cameras at the start and finish lines. Like other boats in the SAY line of fast 29‘–45‘ (8.8m–13.7m) Euro-styled runabouts, the 29E is constructed of all carbon fiber–epoxy sandwich; the bare hull weighs just 400 kg (881 lbs). SAY partnered with Boatbuilders Portier AG on Lake Zurich for construction. And, of course, it is fitted with Ullman’s Daytona shock-mitigating seats. Propulsion is by Kreisel Electric, founded in 2004 by three brothers, utilizing Li-ion battery technology. Principal specifications: LOA 29‘ (8.85m), LWL 25‘ (7.62m), beam 9.1‘ (2.78m), draft 1.5‘ (0.46m), lightship weight 4,390 lbs (1,990 kg), maximum engine output 360 kW (483 hp), battery capacity 120 kWh. SAY GMBH, Hatternholzweg 13, 88239 Wangen Im Allgau, Germany, tel. +49 7520 96 9900. Kreisel Electric GMBH, Kreiselstrade 1, 4261Rainbach im Mühlkreis, Austria, tel. +43 7949 21400. Ullman Dynamics, Talattagatan 16, S-426 76 Gothenburg, Sweden; tel. +46 708 26 00.